Pain Revolution 2018 is now over – a 750 km bike ride and pain education tour across rural Australia. I am exhausted and I didn’t even ride – I was in the education team, but then again, educating can be far more exhausting than riding a bike through the Australian Alps. Read more about the Pain Revolution here. Enjoy a two minute summary of the ride below. We taught 9 outreach events to over 1000 health professionals and the public in small and large rural communities. The education was based on adaptations of target concepts from Explain Pain Supercharged. 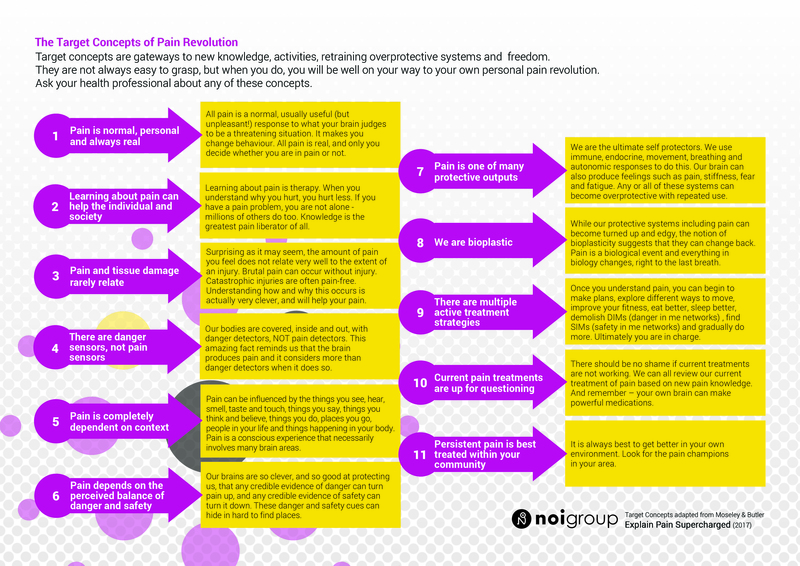 The Pain Revolution target concepts and explanations are listed below. We knew them off by heart by the end of the ride. Note the two new target concepts for this group. Number 9: “Current pain treatments are up for questioning” – a clear push to patient empowerment and challenge to the current dominating pharmacological and surgical options. Number 11 ”persistent pain is best treated within your community.” – sustainable answers for most persistent pains are best found in the local community, itself a potentially powerful context for change. The Local Pain Educator Programme within Pain Revolution supports this concept. NOI was proud to be a sponsor of Pain Revolution 2018. Watch out for Pain Revolution 2019. The Explain Pain Assessment Visualised – Question 4.